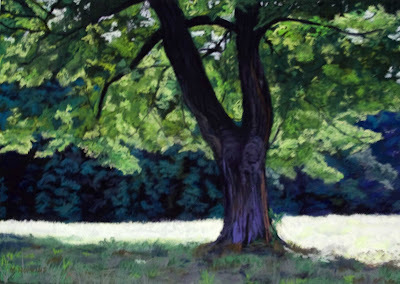 The photo for the pastel painting of this tree was taken at World's End in Hingham, MA just after sunrise. The backlighting was beautiful, and I loved the colors in the trees in the background. I'll have to arise very early more often. The lighting is fantastic for photography. This is beautiful! I love the painterly effect. Thank you, Diane. I visit your blog often. Your photography is so creative and just stunning.